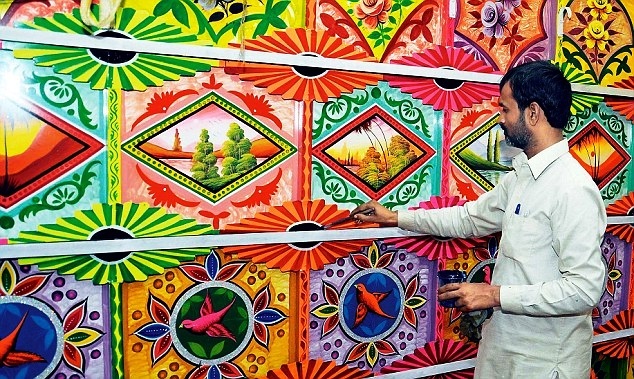 On Thursday, June 24, The US Special Representative for Afghanistan and Pakistan, Ambassador Richard Holbrooke visited Lok Virsa, the only museum in the country with a display dedicated to truck art. According to all accounts, he took a special interest in the truck art portion of the massive museum. He called the truck art display “art on wheels”, which could be a reference to the book with the same name. Members of his staff delegation entered the cab of the aging truck that sits outside the museum. I’ve commented before that the truck art exhibit at Lok Virsa does not do justice to the art. Centered around a diorama of a truck tea shop and a side of the vehicle, it is really more of an obligatory nod to the art and not a serious treatment. In fairness, I suppose its marginally better than many of the other museums in Islamabad, many of which are in more desperate need of repairs and support. In the more than 18 months that Holbrooke has been in office, he has done an excellent job of maintaining the status quo. Truck art is threatened but it would be best if this wonderful art continued for years. Let’s hope that Holbrooke has the same effect on the present state of vehicular decorations that he has on other issues.